The objective of the present study was to evaluate the accuracy of six different equations for weight estimation of camels using body measurements as chest girth, height at withers, and hump girth in order to identify the most reliable equation for use in the field. The prediction equations that were compared were those of Boué Revue d’Élevage et de Médecine vétérinaire des Pays tropicaux 3 (1), 13–16, 1949; Graber Revue d’Élevage et de Médecine vétérinaire des Pays tropicaux, 19, 527–543, 1966; Wilson Tropical Animal Health and Production, 10, 19–25, 1978; Field Proceedings of the Khartoum workshop on camels V1, 209–230, 1979; Bucci et al. 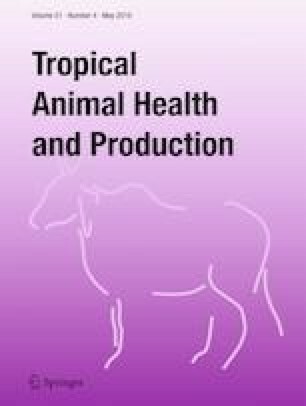 Indian Veterinary Journal, 61, 26–30, 1984; and Yagil A Handbook for Camel Breeding, 1994 noticed as BW1, BW2, BW3, BW4, BW5, and BW6, respectively. The dataset used for this evaluation is the one published by Boué Revue d’Élevage et de Médecine vétérinaire des Pays tropicaux 3 (1), 13–16, 1949. Range observed in predicted weight, mean prediction error (MPE), residual mean square (MSE), mean square prediction error (MSPE), coefficient of determination (CD), and concordance correlation coefficient (CCC) were used to assess the different body weight prediction equations. Moreover, paired t tests were applied to compare the true weight and each of the six predicted weights. From the six prediction equations, range observed in predicted weights varied from 193 to 237 kg, MSE from 335.5 to 806.1, MPE from − 129.8 to 24.7 kg, MSPE from 329.4 to 17,617.1, CD from 0.753 to 0.867, and CCC from 0.162 to 0.928. BW4 presented the best prediction results, showing a low MSE, high CD and CCC, whereas BW3 yielded the least accurate estimate of body weight and had weak statistics. The study concluded that BW4 is the most reliable of all equations to estimate camel’s body weight, whereas BW3 is less reliable and its use must be discontinued. The author thanks Bernard Faye, Elena Ciani, and Asma Kamili for providing him with some weight prediction formulas.